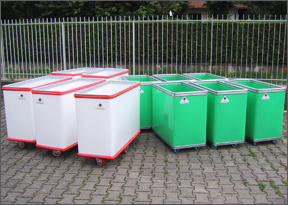 Plastic trolleys, containers, trolleys for laundry, Boxroller®, polyethylene trolleys: this is production range of Dante Bertoni Srl Company, is successfully present in his market segment since more than 80 years. Together with the cylindrical and rectangular containers, True Vulcanized Fiber made characterizing the first production, oriented to various fields and industries. Always careful to the new developments and ready for the challenges, Dante Bertoni Srl is currently present with his products in 46 different countries everywhere material handling is requested. 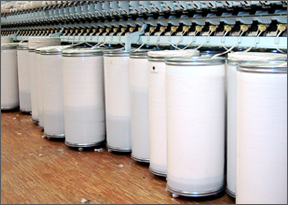 Containers for textile industry, cans for spinning and others containers for storage cops, for dry cleaning and finishing. Trolleys for industrial laundry, trolleys for linen transport and others containers in non-toxic polyethylene, hygienic and resistance. 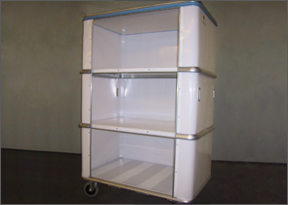 Trolley in robust plastic and manageable suitable for schools, libraries and community for the transportation of books and equipment. 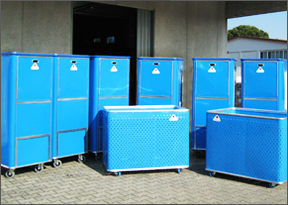 Containers for linens and trolleys for hospitals. Non-toxic polyethylene body. Pantograph system on request. 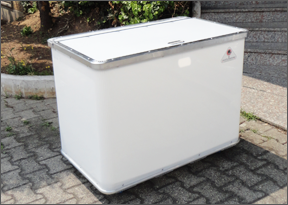 Plastic trolleys (HDPE, high density polyethylene “food grade”) suitable for safe transportation of food. 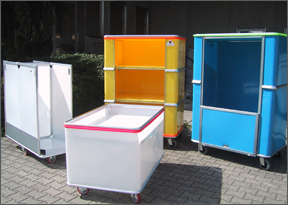 Plastic TROLLEYS for the mechanical industry, robust and suitable for the transport of machined parts or components for assembly.